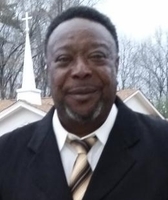 Provide comfort for the family of Anthony Lawton with a meaningful gesture of sympathy. Anthony Craig Lawton was the 2nd child born to Mr. James (Shorty) Arthur and the late Dorothy Lawton, Thompson on March 8, 1963 in Daingerfield, Texas. Craig was reared in Daingerfield in his early years by his Grandmother, Edna Lawton and later moved to Dallas, where his mother carried him to the house of God at Mitchell Street Church of God in Christ, under the pastorate of the late Dr. Edward L. Battles. He attended South Oak Cliff High School where he was active in sports namely, Football and Basketball and his classmates remembers him as being a very humorous person. Craig had a career at Texas instrument, Dallas Independent School District, and currently at Metro Security Services. Craig was loved by many in his neighborhood, and the surrounding Dallas, area. He was preceded in death by his mother (Dorothy Thompson), grandparents, eight uncles and two aunties. He leaves to cherish his memory: his Father, James (Shorty) Arthur, wife- Linda Lawton, daughter- Annisha Lawton and brother- Delton Lawton all of Dallas, Texas; One sister-Jacqueline (Andy) Austin of Daingerfield; Texas; one Step-Sister Yolanda Gates of Italy Texas; Six grandchildren; 2 special ones he helped rear, Montrevia Durham and Breanna Durham; five-nephews, one -niece, seven-uncles, eleven- aunties, one great auntie, many Special Cousins that was reared with him as Brothers and sisters; and other relatives and friends. To send flowers in memory of Anthony Craig Lawton, please visit our Heartfelt Sympathies Store. Provide comfort for the family of Anthony Craig Lawton by sending flowers. My condolences to the Lawton families. I'm sorry to hear about the loss of dear Anthony. Some Bible scriptures that have helped me during times of loss include Isaiah 26:19 and Psalm 37:28,29 which states in part: "Your dead ones will live...They will rise up". And the Bible also says "The righteous themselves will possess the earth and they will forever reside upon it". Therefore the Bible promises that we may be reunited with our loved ones lost in death by means of an earthly resurrection. This is further confirmed by John 5:28,29 which says "Do not marvel at this, because the hour is coming in which all those in the memorial tombs will hear his voice and come out". This is possible thanks to Jesus Christ's ransom sacrifice. Thus we have a genuine hope of everlasting life in a world without wickedness or suffering.